Curious about homeschooling? Want to know facts instead of stereotypes? Need a program for your community group, education organization, university classroom, business forum, political association, or parents meeting? Homeschooling 101: Homeschooling for Non-Homeschoolers is the perfect introduction to homeschooling for people who would like to get real information about homeschooling in Virginia and the United States. If you’d like to hear about the new face of homeschooling, let’s work it out so I can speak to your group. 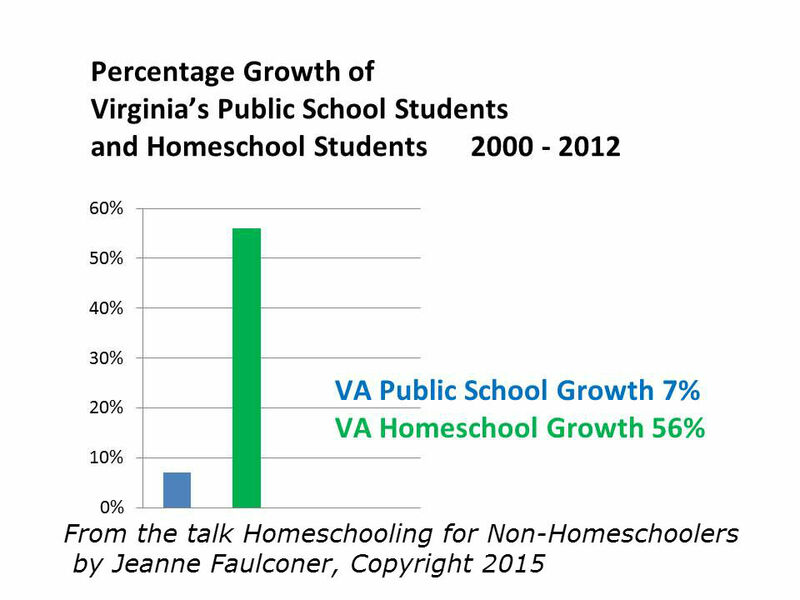 We can talk about who is homeschooling, why people homeschool, statistics in Virginia and the U.S., approaches to homeschooling, homeschoolers’ relationships with and attitudes toward schools, and how homeschooling is one of the ways to fully meet the legal requirements for compulsory attendance in Virginia. We can also talk about how businesses, libraries, community organizations, educational institutions, museums, and others can and do partner with homeschoolers. Homeschoolers in Virginia, taken together, would amount to the eighth largest school division in The Commonwealth today, according to StatChat, produced by the Demographics Research Group at UVA. Homeschoolers also tend to be highly engaged in their communities. That’s a group worth knowing real facts about. The demographics of who is homeschooling, what their families are like, and their main reason for homeschooling are much different than the stereotype. I have crunched the numbers both for Virginia and the U.S., using well-respected sources. I have homeschooled from kindergarten through twelfth grade for 17 years in three states in eight different communities, work as a homeschool evaluator, and speak to many homeschooling families at conferences each year. If you’d like an orientation to today’s homeschooling — and to understand how homeschooling parents engage their kids in learning — contact me to set up a lively presentation or consultation. This entry was posted in Conferences and Workshops, Engaged learning and tagged consulting about homeschooling, guest speaker homeschooling, homeschool demographics, homeschool presentation, homeschool program for non-homeschoolers, Homeschool speakers, homeschool workshops, Homeschooling for NON-Homeschoolers, homeschooling in Virginia, public speaking about homeschooling, real facts about homeschooling, speakers bureau homeschooling, Speakers on homeschooling, understanding homeschooling, Virginia homeschooling explained, Virginia homeschooling statistics, Virginia speaker about homeschooling, Who are homeschoolers? on April 10, 2015 by Jeanne Faulconer.